Getting married is one of the biggest and best days of your life and you will want to look your absolute best. I will make sure you feel happy and confident with your chosen look which will enhance your natural features and fit in with your own personal style. A Trial is necessary for a bride at a location of your choice to discuss ideas and get your desired look, this is recommended around 6-8 weeks before your big day and will take approximately 2 hours. Bridesmaids and Mothers are welcome to attend and if they would like a trial this can be arranged. On your Wedding day I will arive promptly at the agreed location and begin the application. A cleanse, tone and moisturise is included before your makeup if required. 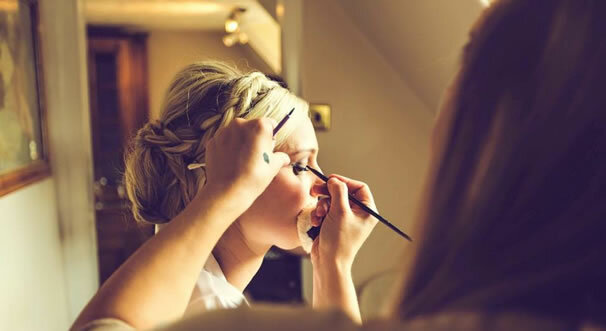 Bridesmaids and other members of the wedding party are usually started first and the brides makeup will be applied after the hair is styled and before the dress is put on.